Rory McIlroy has won the European Tour's Race to Dubai for the second time in three years after Brooks Koepka triumphed at the Turkish Airlines Open. McIlroy, 25, did not play but took the title because Sergio Garcia, Marcel Siem and Jamie Donaldson failed to win. German Siem started the final round in Antalya one shot off the lead but a one-under 71 dropped him to eighth. England's Ian Poulter missed a six-foot putt to force a play-off as Koepka shot a seven-under 65 to win on 17 under. Poulter, who let slip a six-shot lead in the third round, matched American Koepka with four birdies in his opening nine holes. However, the Englishman was only able to pick up one more shot on the back nine, at the par-five 13th, which Koepka eagled to add to his birdie on the 10th. 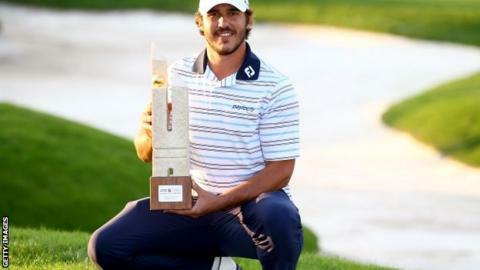 Koepka parred his final five holes to win his first European Tour title, although Poulter gave himself a chance of getting into a play-off with an excellent bunker shot on the last but he was unable to convert the putt. Sweden's Henrik Stenson had nine birdies and a bogey as he scored the joint lowest round of the day, an eight-under 64, to finish third on 14 under and move up to second on the European Tour's money list, 2.7m euros (£2.1m) behind McIlroy, although he had no chance of catching the Northern Irishman. Siem, Garcia of Spain and Welshman Donaldson all needed to win in Turkey and at next week's season-ending DP World Tour Championship in Dubai to deny Northern Ireland's world number one McIlroy top spot. Four-time major winner McIlroy, who won the Open and PGA Championship in 2014, will return to action in the final event of the season, which begins on Thursday.